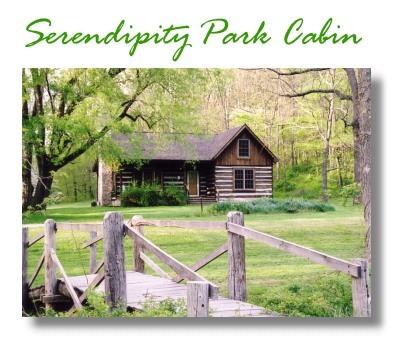 Serendipity Park Cabin, as its name suggests, is a lucky discovery on 70 acres next to Brown County State Park. It is surrounded by woods & meadows, hills & valleys, and bottomlands & creeks. Please be aware that all state parks have entrance fees, and guests should have a park pass or pay these fees at an official park gate. Lake Ogle in the State Park is just 1/4 mile from the cabin. There is a beautiful trail around the lake and another from the lake to the Lookout Tower for a long distant view of Brown County. For a real challenge, try hiking cross-country to Story, a tiny village four miles away with a great restaurant. At night you can hike to the top of the hill and see millions of stars undimmed by light pollution. This cabin is ideally situated for nature lovers so bring walking sticks, boots, binoculars, and cameras. The exterior of the cabin is faced with hand-hewn logs from a barn which was on the site for over 100 years. There are two porches, one on the sunny south and one on the shady north. Sit on the porches at night and listen for whipporwills or owls. Enjoy a relaxing soak in the hot tub or enjoy the view at the pond. Sit on the front porch during the day to enjoy birds attracted to the spring and creek. A grill and fire pit will add to your enjoyment outside. The inside of the cabin is very open and light due to the many oversized windows, three skylights, and a vaulted ceiling. Turn on the gas fireplace if it's chilly. Cook a great meal in the fully furnished kitchen. Play board games or watch Satellite TV, but don't forget to enjoy the quiet. When it is time to retire for the night there are two bedrooms each with a comfortable queen size bed. and one full bath. If that's not enough, there is easy access to Nashville and Bloomington with their many restaurants, shopping, art galleries, sporting events, and all kinds of entertainment.